While in Fortune City, a zombie outbreak occurs and Chuck must survive the onslaught of the undead for 72 hours. Pitted against bosses and psychos – tens of thousands of zombies and the constant countdown of the clock - while potentially rescuing other survivors of the zombie apocalypse, you must also unravel the greater conspiracy behind the outbreak. 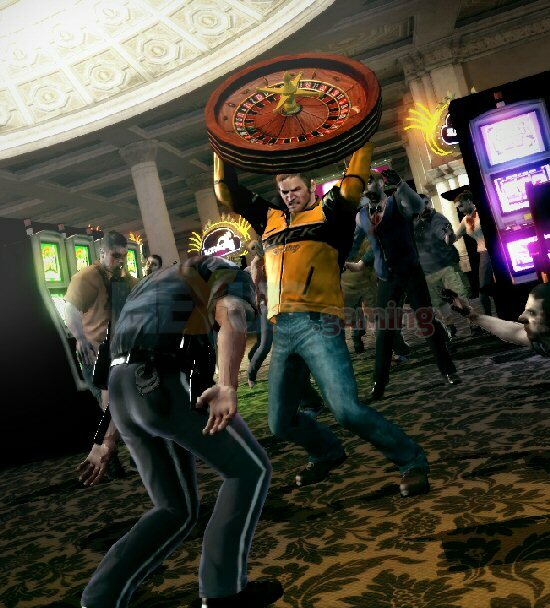 The Dead Rising series is renowned for letting players pick up and use everyday items to fend off hordes of the undead, but Dead Rising 2 adds a new twist with combination weapons. Take two objects, add a roll of tape plus the inventiveness and skilled hands of Chuck Greene and an innocent water gun and a can of gasoline become a deadly flamethrower, while a garden rake and car battery combine to create an electrified zombie prod. Using combination weapons to fend off hordes of the undead in fun and grotesque ways is only just the beginning as the more combo weapons a player uses, the more Prestige Points (PPs) they will rack up. Earn enough PPs and Chuck levels up which will helps him along the way.